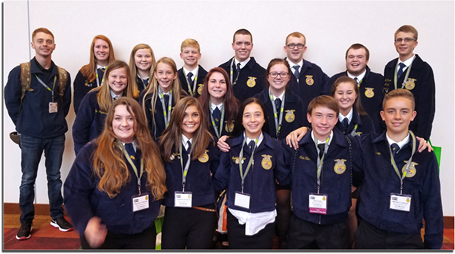 The Mount Vernon FFA Chapter recently attended the National FFA Convention in Indianapolis, Indiana. At the convention the chapter was able to watch Clayton Noggle, a Mount Vernon FFA graduate, receive the American Degree. The American degree is the organization's highest degree. National Convention gave members many opportunities. They were able to hear from keynote speaker, Jason Lepley. Jason shared his wisdom and advice for members as they continue their path through the FFA. Members also attended leadership seminars and worked on program planning for the local chapter. Through the workshops, members learned to identify the needs of the community and the chapter to implement in program planning. The chapter was also able to attend the career show. While at the show members explored colleges from around the country that have agriculture programs.